KEF Egg review | What Hi-Fi? When we hear the phrase ‘KEF Eggs’, the company’s popular 5.1 surround speaker packages come to mind. Those speakers picked up the affectionate nickname from reviewers and owners alike, thanks to their egg-shaped design. Although KEF initially seemed uncertain about the name, they acknowledged this unofficial moniker when they released the ‘E-series’ in 2013. 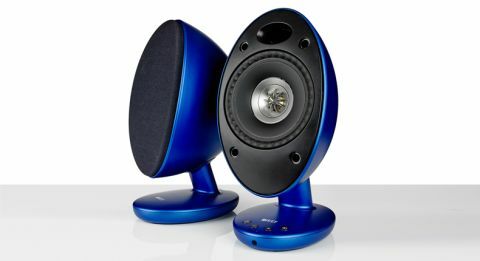 Now the company has given in entirely, officially naming this new system, the ‘KEF Egg Wireless Digital Music System’. Catchy. It has been a while since KEF has launched a new product based on this iconic design, and these new ones are a wireless and powered 2.0 offering. The emphasis here is on flexibility. No longer are you tied down to amplifiers: you can use these with computers, portable devices and TVs. The design hasn’t changed much over the years. ‘Egg-shaped’ is by far the most ubiquitous description of course, but we’ve also heard people liken them to car wing mirrors. The build quality is good; the enclosure is predominantly plastic but the speakers are reassuringly weighty. It will take considerable effort to knock them off your desk. Peel off the speaker grilles and you’ll find KEF’s trademark Uni-Q driver, which has a tweeter placed in the middle of the mid/bass driver and is claimed to aid precision and dispersion. KEF says these new eggs are the most “sophisticated and acoustically accomplished version” of the speaker. The tweeter is internally vented to prevent potentially distorting high pressures from building up behind the dome. The tangerine-shaped waveguide position in front of the tweeter helps disperse the sound spherically for wider and more even dispersion. The ‘Z-flex’ cone surround around the mid/bass diaphragm limits secondary radiation. The midrange cone is made of aluminium to retain stiffness, and there’s also a damping ring to control resonances. The two KEF Eggs look identical at a glance, but this is actually a master-slave system. One does the heavy lifting and passes information to the other. All the processing takes place in the foot of the master unit, which features a mains input (external power brick, not figure-of-eight cable), mini USB input and an output for connecting to the slave unit, plus a subwoofer output for (optionally) adding lower frequencies later. Puzzlingly, KEF has decided to hide a hybrid 3.5mm/digital optical input behind a removable wedge of plastic at the side of the device. It would have been neater to have this at the back with all the other connections, and you wouldn’t lose a chunk of plastic either. At least the USB and optical cables are included. The USB input can accept high-res audio up to 24bit/96kHz, and there’s also Bluetooth 4.0 with support for aptX devices. You can switch between inputs and adjust the volume using buttons built into the base of the master unit. Alternatively you can use the remote control, which we’re pleased to see is a proper remote and not one of those plasticky ‘credit card’ type abominations. We like the flexibility of having a multitude of connections – that’s not always the case with wireless desktop speakers. The hi-res USB input will most likely go straight into your computer for desktop listening, while the optical input lets you use the units with your TV instead of a soundbar. Thankfully, sound quality is good whether you use them up close or from across the room. The Uni-Q drivers disperse sound in a seamless and immersive way. Integration is a particular forte: no matter where you stand in the room it is hard to tell where midrange ends and treble begins. It’s not the most hard-hitting sound we’ve heard, but the Eggs make up for that with agility and clarity. Voices are projected cleanly, with a convincing richness. Instruments are accompanied by natural textures and taut rhythm. It’s a balanced sound, too. Despite the inclusion of a subwoofer output, we don’t immediately feel the need to get one out of the stockroom and hook it up. The low end won’t shake your house’s foundations, but it goes sufficiently deep. The best thing about it is the control in the low end: there’s an eloquence there that even the Award-winning Ruark MR1s would struggle to muster.